Among the largest excavators in the world, the Bucyrus RH400 stands over three-stories-high and can move 9,000 tons of earth in an hour. Sheo. miniaturized this mining giant to a minifigure scale model, complete with Power Functions. The top deck of this machine shows thoughtful details like railings, water tanks, fire suppression equipment, and even a service crane. 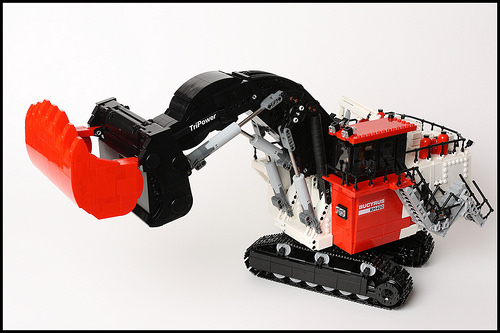 The digger arm contains graceful (and functional) curved shapes combining Technic and System brick. The operator cockpit even has space for minifigure operator. Like any awesome Technic creation, this model comes with a full compliment of power features. For example, the retractable stairs leading up to the operator’s cabin extend for the operator to climb up. The model has incredible range of motion, swinging in 360° for separate digging and dumping phases. In addition to moving the model, the tracks also include suspension for the tread wheels, allowing the model to roll over low obstacles. The digging arm raises, lowers, and extends, while the shovel can independently articulate from the arm. 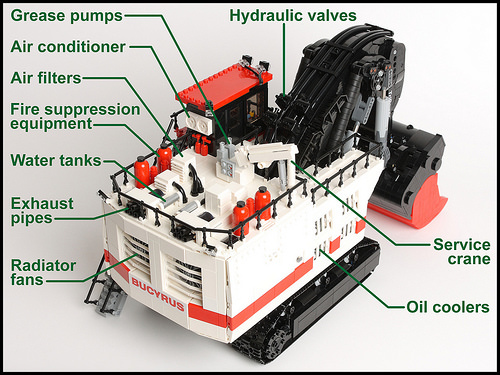 In case you are not completely familiar with the main working parts of an excavator, Sheo has created this handy labelled view of his creation.